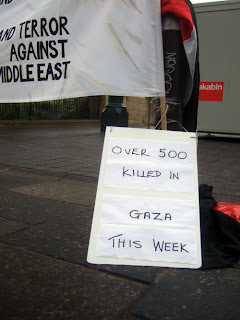 Stop the slaughter in Gaza. Protest. "At least 40 people have been killed in an Israeli air strike on a United Nations-run school in the Gaza Strip, Palestinian medical sources have said. A number of children were among those who died when the al-Fakhura school in the Jabaliya refugee camp took a direct hit, doctors at nearby hospitals said. People inside had been taking refuge from the Israeli ground offensive. Earlier, the International Committee of the Red Cross (ICRC) warned of a "full-blown humanitarian crisis" in Gaza. Speaking on the 11th day of the Israeli assault, a senior ICRC official, Pierre Kraehenbuhl, said life in Gaza had become intolerable." The slaughter in Gaza is intolerable. Protest. March through the city centre and to the US Consulate. Bring in-date medicine for Gaza, and spare shoes.